1. 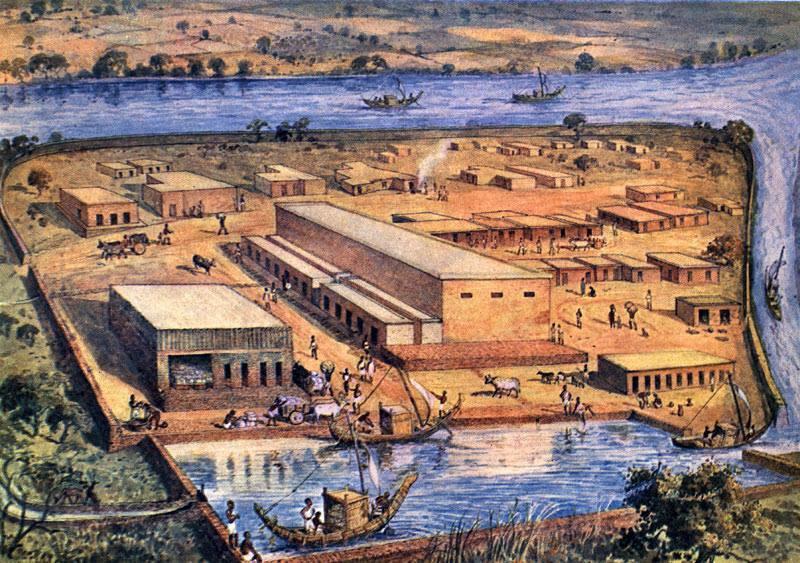 A conjectural view of Indus settlement at Surkotada. 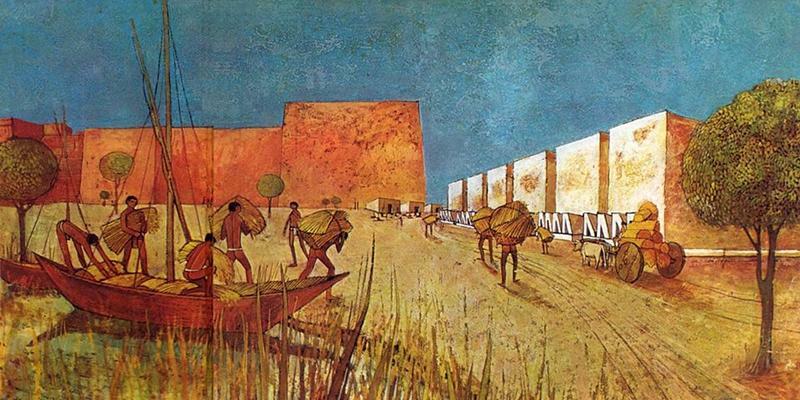 Painting by Lalit Jain, Archaeological Survey of India. 2. 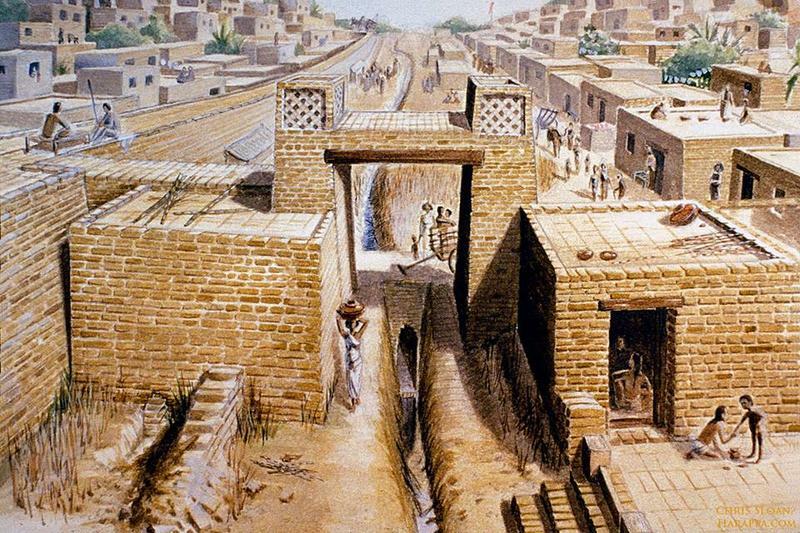 One of the most detailed reconstructions of an ancient Indus gateway, this one on Mound E at Harappa. 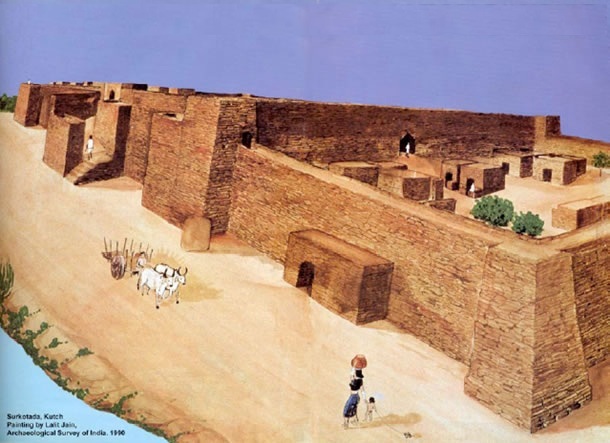 The reconstruction was drawn by Chris Sloan, based on the work done by the Harappa Archaeological Research Project. J.M. Kenoyer writes: "A series of side rooms were also excavated along the eastern edge of the gateway in 1995. The latest phase of construction also included a large east-west oriented doorway leading through the eastern edge of the gateway. This doorway appears to have constructed with wooden beams with a threshold embedded in the baked brick structure.The size of these beams can be calculated from the sockets in the baked brick structure, with the upright posts being 33 centimeters by 44 centimeters in cross section and the anchor posts being 25 centimeters by 17 centimeters in cross section. This would give the door dimensions of 2.35 meters wide (measuring from the inside of upright posts) with a height of 3.5 to 4 meters (based on traditional proportions for large doors). Another north-south oriented second inner doorway is found on a second construction phase baked brick structure, but probably reused during the third phase. The sockets for the door posts are 16 cm and 20 cm square with an inside measurement of 1.6 meters wide. Using the traditional proportions for a door gives a height of approximately 2.5 meters. The function of the side rooms is not known from any artifacts, but may have been entrances to the city when the gateway was blocked by the corbeled drain or rooms for officials/guards assigned to the gateway." 3. The phantasm by Sir Mortimer Wheeler (Image 1) , a diagram of the structure by John Marshall (Image 2), photographs by Jonathan Mark Kenoyer and Richard H (Image 3 and 4). The basic function of this structure on Mound F - there is also one in Mohenjo-daro - remains unknown. 5. 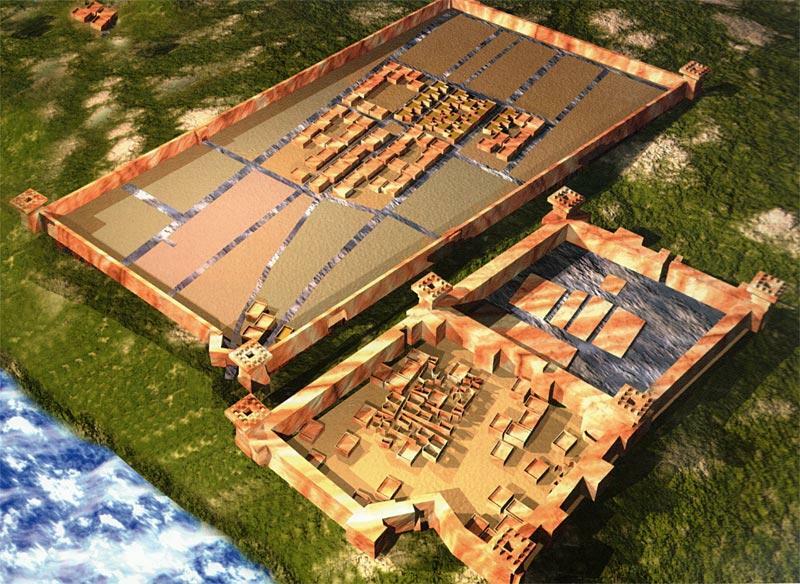 Kalibangan reconstructed image of the citadel and lower town. Computer illustration: Sushi Misal.